Plotly R figures appear interactively within RStudio's graphics viewer without any calls to Plotly's server by default. This means that all plots generated in RStudio are offline. You will have to make a api_create call in order to upload your plot onto the Chart Studio Cloud. When you're ready to share, you can publish your Plotly R figures to the Chart Studio Cloud or to your company's internal Chart Studio Enterprise server. 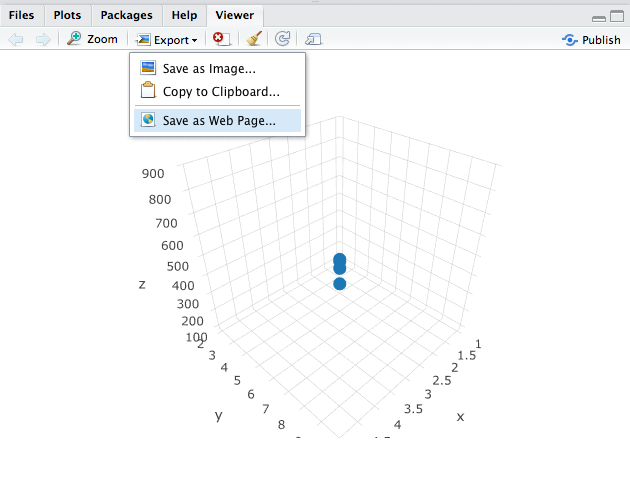 To get started with Plotly offline in RStudio, download Plotly's free R client. You could treat the viewer in RStudio as an embedded web browser. Thus it's possible to view the source of that page. What you have to do is click the export button in the viewer, and choose Save as Web Page. You will then be prompted to save the web page. Then you will be able to view the source code when viewing the plot. htmlwidgets::saveWidget(as.widget(p), "graph.html"), where p will be your plot figure. Note that you could name the html file to anything you choose.